The restaurant is just near the entrance. However, the blaring music from the gaming section fades as you move inside. Bright carnival lights arranged in patterns of huge stars welcome you. The tables are smooth and white above which hang carnival canopies fitted with lights. Their candy stripes add brightness to the place. 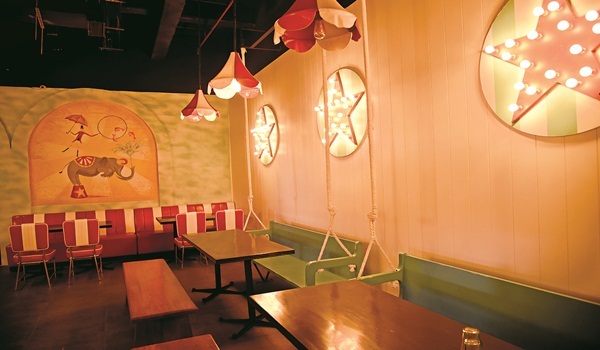 The themed canopy lamps dangling near the chairs add their magic too. The floor sports a rugged look, perhaps to lend it a festive and casual look where families with children come running to grab a bite. The ceiling has the industrial look with pipes, wires and joints kept naked. At the extreme end of the restaurant is the dessert corner. Well, since this is a restaurant whose stake holders are sportsmen like Sachin Tendulkar, Virat Kohli and Cristiano Ronaldo, the sections have been named accordingly. Thata��s how you come across section names like a�?Quick Runsa��, a�?Step Right upa�� and a�?Serving up Acesa��. Even the beverage section has names like Tendulkar, Kohli and Ronaldo Signature Cocktails. And what do you expect in such area of spins and throws? Cocktails like Feroze Shah Kotla, Wankhede, Old Trafford and Eden Gardens. They also let your customise your own drink and they have aptly named it a�?Design your own gamea��.